Not too long ago, I refinanced my home to a new, lower interest rate. The rate is below 4%, which is a vast improvement over what it was before. With the monthly savings, and the fact that we are now making bi-weekly mortgage payments, I feel pretty good about the situation. But, now that we’ve re-arranged matters, I’ve had people ask me if I plan to super-charge my efforts to repay my mortgage. While the bi-weekly payment schedule will shave off some of the repayment, it’s not like I’m going to have my mortgage paid off in 10 years or anything. And should I want to pay off my mortgage that early, anyway? One of the biggest arguments against paying off a mortgage early is the fact that you could be doing something else with that money and earning a better return. Sure, it stinks to pay interest. 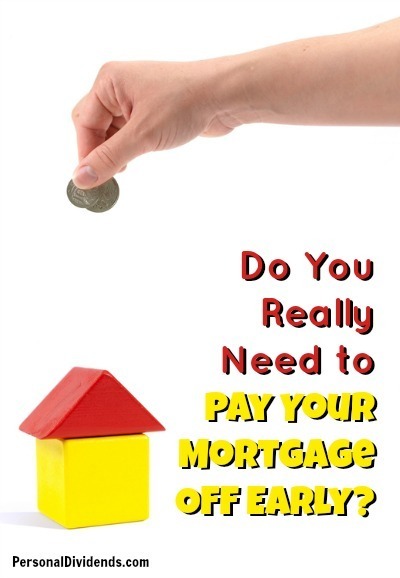 But if you have a low-rate mortgage, you might be able to earn more if you took the money that would have gone toward paying off your mortgage early and invested it. Another thing that has occurred to me is that I may not be in the house for very long. My husband is looking for jobs, and we could move. Do I want to aggressively pay down the mortgage when we might move in another year or so? Paying down the mortgage would help build equity, and could mean a larger amount for a down payment on a new home later, but I could accomplish something similar by taking the extra money and putting it in a high-yield savings account. At least there I’d be earning interest (even if it isn’t very much). If I take $500 a month and put it toward my mortgage, I can free up extra room for when the house sells. But what if the home value drops? Then I have to sell for less than anticipated, and that means that I paid that extra for no real benefit. If I put that money in a high yield account, though, it remains available for me to use however I want. While some people like the idea of paying off the mortgage as early as possible, leading them to feel financially free, that’s not a move for everyone. Weigh your options before making a decision. You might decide it’s in your best interest to keep the mortgage around for a little bit longer. Bear in mind that prepaying a mortgage is identical to making a guaranteed, risk-free investment with a return equal to your after-tax interest rate. At the low mortgage rates that have prevailed the past 5 years, looking strictly at the mathematics of prepaying may make it hard to justify. But there are intangible benefits too which, though impossible to quantify, need to factored in. Debt = risk, and when debt is gone or lessened, a family’s risk level is lessened too. And not having debt gives one greater freedom to pursue opportunities that may not pay off immediately. I’m in agreement. If you can be making more money elsewhere, it doesn’t make sense to pay it off early.